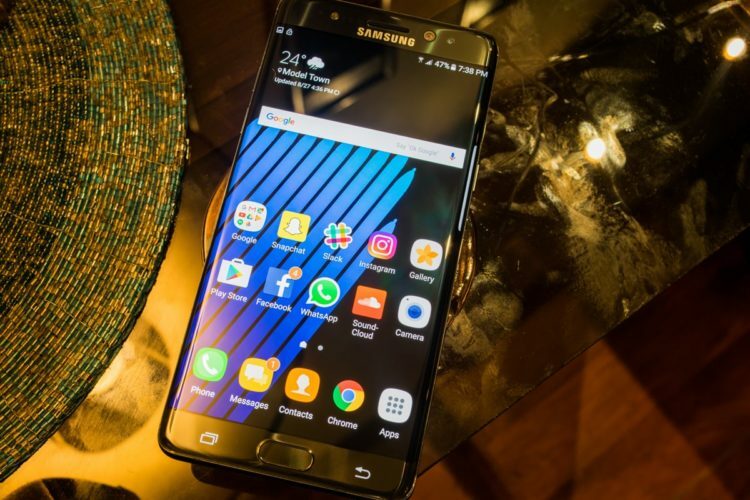 Last year, the Galaxy Note 7 was one of the best smartphones made by Samsung. It had class leading hardware combined with the new Grace UX software. The phone was an absolute beast in the performance department too and received praise from reviewers from all around the world. All was good until the Note 7 met its untimely death by catching fire, getting recalled, catching fire again and then eventually getting its production shut down for good. This year, Samsung launched the Galaxy S8 which also proved that the little incident with the Note 7 didn’t hurt Samsung at all and they’re back with another great device. Later this year, we’ll also see the launch of the Galaxy Note 8. As with a lot of other popular phones, details start leaking a couple of weeks or months before the official launch and the Galaxy Note 8 is no different. Here’s everything you need to know about the new upcoming Galaxy Note 8. This year’s Galaxy S8 and S8+ featured huge 5.8-inch and 6.2-inch screens but with a smaller overall footprint. The Note 8 is going to follow the footsteps of its S series siblings but will go a step further and use a 6.4-inch screen. While the screen sizes of some recent smartphones from Samsung are reaching that of some entry-level tablets, the overall size of these devices is smaller (due to the lack of/small bezels up front) so handling them won’t be an issue. It’s also rumored to be called the Infinity Display, a name we believe may stick with upcoming flagship smartphones from Samsung. Edges are still going to be rounded, however, according to some leaked renders the display is not going to be as curved as the S8/S8+ and the top and bottom edges are going to be more straight. The extra large 6.4 inch display is evident from the above image. The curves are toned down a bit from the S8 though. You can also make out the buttons on the side of the phones. The right side houses the power button meanwhile on the left side you get the volume rocker and what looks like a Bixby button. Not long afterwards, Evan also shared another post that revealed the Note 8 from all angles. This shows the Note 8 in not only the Midnight Black color but also in Gold. However, more importantly, you can also see the back of the Note 8. You can see the dual camera setup on the back along with the fingerprint scanner. The fingerprint scanner was actually rumored to have found a new place on the phone – rather than on the back with the camera module – but based on the renders above we can see that it is still up there alongside the cameras. Up top on the front you can see the front facing camera and what looks like the IRIS scanner, carried over from the Note 7 and S8+. The 6.4-inch screen isn’t the only highlight of the Note 8. Most recent Samsung flagships have stuck with a QHD display and although, it’s not bad at all, the rest of the world is moving on and allegedly Samsung has decided to do so as well. The Note 8 is rumored to include a 4K display, a first for any Samsung smartphone. How it will handle the 4K display is still not known. Samsung can go the same way as Sony and go for a display that switches to 1080p and 4K depending on what’s on the screen. Smartphones have reached a stage where there probably isn’t going to be much more innovation to make them better. Samsung’s recent flagships are proof of that especially since the Galaxy S8/S8+ also featured mostly the same camera setup as last year’s Note 7 and S7 Edge. However, if the rumors are to be believed, this year’s Note 8 is going to be different in the camera department. Reports say that the Note 8 will feature a dual-camera setup (as seen in the leaked renders above) that will rival that of the iPhone 7 Plus. The dual camera setup will be the most important upgrade. The Note 8 will feature a 13 MP wide-angle camera and another 12 MP telephoto lens. Both of these cameras will have optical image stabilization (OIS) and 6-element lenses and this whole setup will also have 3x optical zoom. Being a flagship, there’s no doubt that the Note 8 will be packing top-of-the-line specs. 4 GB RAM is the norm nowadays and it is more than enough but with many flagships moving towards 6 GB of RAM, expect the Note 8 to do the same. The processor is expected to be Samsung’s own Exynos 8995 or the Qualcomm Snapdragon 835 which has proven itself to be a powerful processor. So, that’s the performance taken care of. Internal storage is also limited to 64 GB. However, storage options for 128 GB and 256 GB might be available. The Samsung Galaxy Note 8 is expected to launch at an event that is to be held on 23rd August. To wrap this up, the Samsung Galaxy Note 8 is expected to launch with the Infinity Display, dual camera setup, improved performance and the Bixby button.